Generative Design can deliver great advantages. However, it often exports mesh geometry. This eBook details Facet Modeling capabilities that can easily modify such designs. What is Generative Design?, What is 3D Printing? This eBook is of most value to managers of engineering teams trying to gain the most value from Generative Design. Designing products today is a tall task. Complexity is increasing as more and more technologies are integrated into products. The demand for collaboration is climbing as more and more suppliers become involved in the development process. Schedules are only getting shorter in a race to get to market as quickly as possible. Engineers, burdened with a plethora of responsibilities, barely have time to find a feasible design, much less a better one. In this context, engineers often find they need more bandwidth. Fortunately, a new technology, Generative Design, offers some hope in this regard. Given a set of constraints defined by an engineer, this technology autonomously produces a number of alternative designs using algorithms such as topology optimization as well as those drawn from nature. Generative Design essentially acts as a software employee that presents its options to the engineer. As a result, engineers can consider many more alternatives than were previously possible. It has numerous applications in Concept Design and Detailed Design. 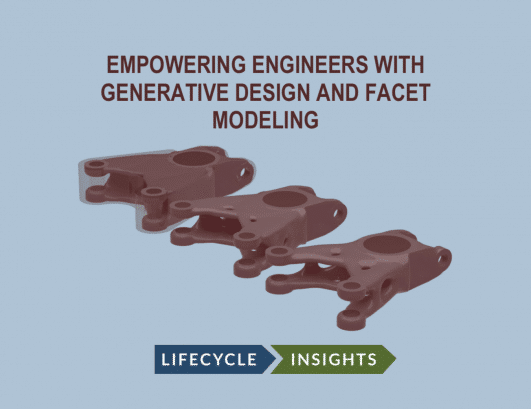 Incorporating the results of Generative Design, however, requires specialized geometry capabilities called Facet Modeling. Computer Aided Design (CAD) applications are only now starting to integrate such functionality alongside traditional Parametric Modeling and Direct Modeling. This is a crucial but oft-overlooked set of tools that need to work tightly together. The purpose of this eBook is to offer insight into all of these topics. It starts by looking at the constraints on today’s engineers and the effect they have on the quality of design. Next, it delves into Generative Design, offering details on its use and technical considerations, as well this technology’s application to Concept Design and Detailed Design. It finishes by taking a close look at the Two Application and Single Application solutions that are currently available. Throughout, it includes references to findings from Lifecycle Insights’ studies. There is no doubt that designing products today is a difficult task. However, new capabilities like Generative Design offer a means to expand an individual’s bandwidth without much extra effort. The benefits are useful for both the engineer and the organization.